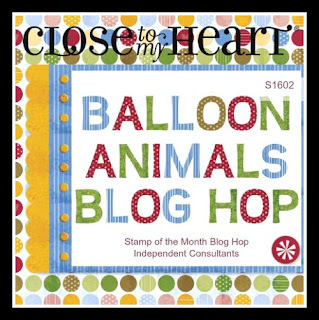 This month we are happy to showcase artwork incorporating the February Stamp of the Month, "Balloon Animals". 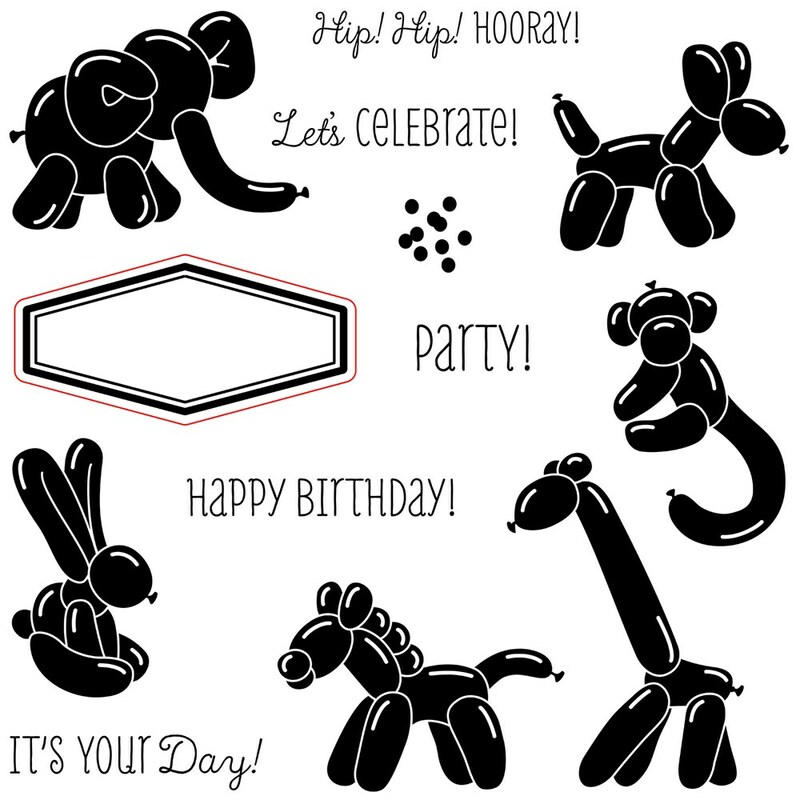 It is this fun stamp set that is perfect for birthdays or celebrating that special something in your life. Don't tell anyone but I bought a kit one time, many years ago, so I could make my own balloon animals. Yes, I sure did! 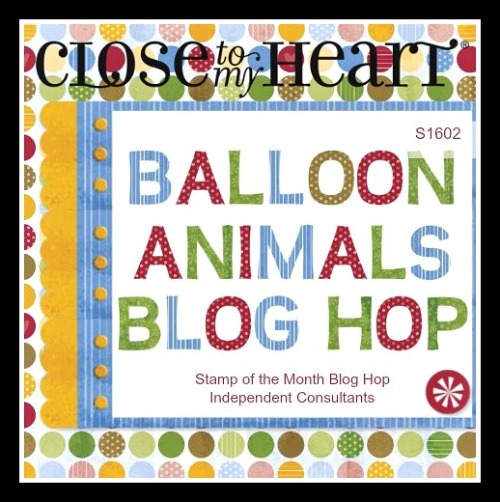 You can get this stamp set for $5 this month, with a $50 purchase! It is valued at $17.95. Click here for those details. If you are coming from Melinda's Blog, you are on the right track. In fact, you can also find a complete list of participants on her blog should you get lost along the way. So...let's get started! Random-stamping a background is one of my all-time fave techniques. Doing so allows you to make a patterned paper of your choosing and that is just what I did here with the "Let's Celebrate" sentiment. The Lagoon sheet of paper in the background is from the Fundamentals line and has some clear embossed texture on it (not so easy to see in the photo). The details of this card are pretty simple, adding some Silver Sequins and Silver Shimmer Trim. Ink colors used for this card were Whisper, Lagoon, Black, and Thistle. Thanks for taking a moment to stop by and now head on over to Michelle's Blog to see what she designed using this stamp set. Love the colors you chose! Cute card. Appreciate your comment, Lela! THANK YOU! Cute card with fabulous stamped background! I agree with others...awesome stamped background....really such a pretty card..perfect colors! I'm humbled by your comment, Coelle. Thank you for taking the time to say so. What a pretty card design. You did a great job fussy cutting the balloon animal. 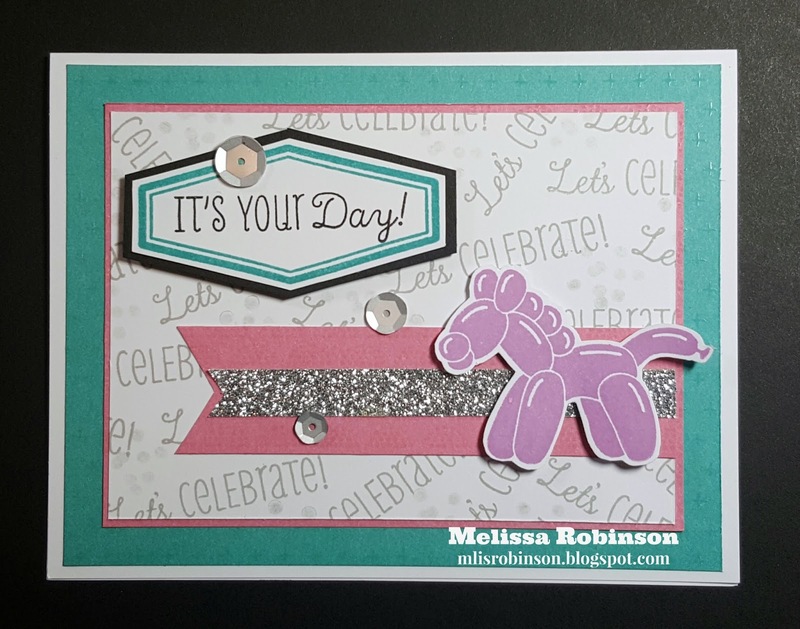 That stamped background is perfect to showcase the pretty pink balloon animal! Love the colors you chose and the sentiment stamed background panel. Great card! So cute ~ Love the way you random stamped the background with all the sentiments. Thanks! That seems to be a big hit! YAY! That little pony is the CUTEST thing...and I love that he's PURPLE!!! CUTE card! Of course he's purple! LOL Thank you, my friend! Appreciate you saying so, Jennifer! THANK YOU! 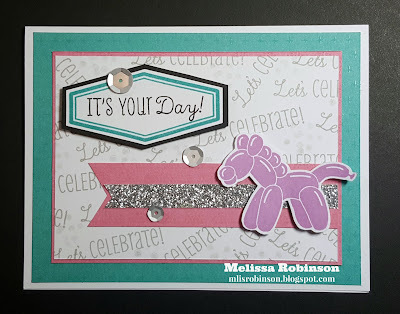 Love your stamped background and color choices! Thank you very much, Terrie! Thank you! Love the 3-D Foam Tape to add some dimension. Ooo - LOVE this card!! The use of the words in the background, and the "matting" of the card front...just beautiful! Fantastic card. 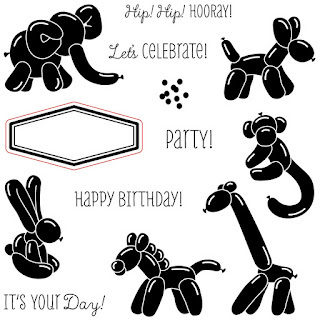 The balloon animal really jumps off the card. Thank you very much, Brenda! Seems like I picked a good color with Thistle. Heart 2 Heart Challenge - "Three"